210 hosts the Alpha Course - a course designed for and open to anyone interested in finding out more about the Christian faith and deeper meaning of life. Find out more at Alpha Pick a photo size (S,M,L,O) and then hit Save option or right click to Save Picture for your FREE download copies. Photos printed through the shopping cart are at the printer’s cost plus a small percentage to cover website fees and maintenance. If you print, all are sized for multiples of 4" x 6", 8"x 12", etc. Lustre finish is best quality. Will keep on website for at least a few months from the event. Alpha Course meeting at 210. 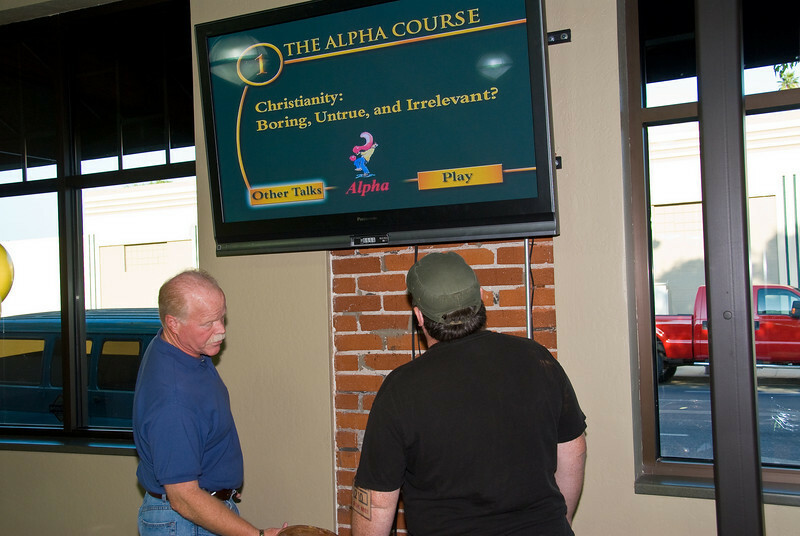 Alpha is a 10 week course where participants have an open discussion of information presented in a video. This is after an enjoyable dinner. Roger & Mike setting up the video.